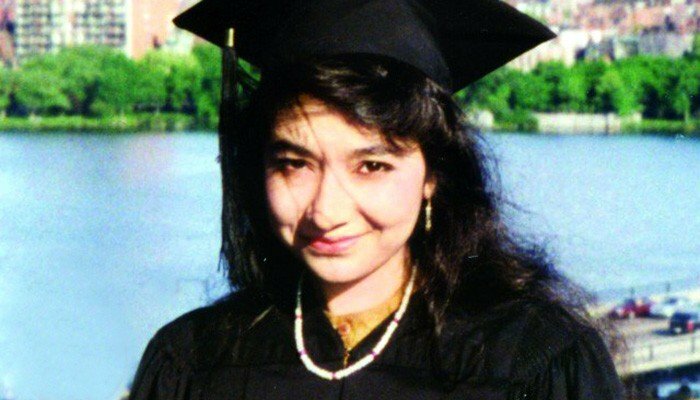 ISLAMABAD: The Foreign Office on Thursday said Pakistan has raised with the United States the issue of Dr Aafia Siddiqui, a Pakistani neuroscientist and mother of three jailed in the US for almost a decade, but no decision has been taken regarding her release as yet. “Since a decision has not been taken regarding her release, we cannot say when she will be freed,” he asserted. "Government of Pakistan has been raising the issue of Dr Aafia Siddiqui with US authorities regularly. Pakistan's CG (consul general) in Houston pays Consular visits to Dr Aafia, periodically, to inquire about her well-being and conveys her messages to Dr Afia's family if any," the Foreign Office said in a statement on Wednesday. The statement further read that Foreign Minister Shah Mehmood Qureshi will soon meet with the sister of Dr Afia Siddiqui in Islamabad. Dr Siddiqui has been in prison since 2010 on charges of attempted murder and assault on US military personnel during an interview with US authorities in Ghazni, charges which Siddiqui denies. She was sentenced to 86 years in prison at the Federal Medical Centre, Carswell, Fort Worth in Texas. “The trip further strengthened the bilateral relations between the two countries,” he added. Further, condemning Indian atrocities in occupied Kashmir, the FO spokesperson said, A parliamentary group in the British Parliament issued a damning report accusing India of mass murder of Kashmiris. “This is the second such report, the first being released by the United Nations Human Rights Council,” he said and added that the report recommends that an investigative committee should visit the occupied valley.